Alan Hauser is a 1974 graduate of the University of Illinois (Champaign-Urbana) with a Bachelor of Architecture Degree and he earned a Master of Architecture degree from the U of I in 1976. He moved to Loveland, Colorado in 1976 and worked for several Northern Colorado firms before founding Architecture One in 1984. Due to a reorganization of the company, he formed Hauser Architects, P.C. in 2003. As a principal of Hauser Architects, P.C., Alan is fluent in the processes of design, construction documents and construction contract administration. His work includes design team leadership in new construction, additions and extensive remodeling projects. These projects have included work in the public and private sectors as well as various governmental agencies. Alan received the Larimer County Building Department’s 2007 Recognition Award for Outstanding Professionalism Through the Construction Process, and has achieved LEED AP Accreditation through the Green Building Council. This has provided him with the critical knowledge needed to respond to the emerging trends in commercial green building design and sustainable design. Alan’s project experience includes extensive work in civic and municipal buildings, health care and recreational facilities and custom single-family housing. He has been a licensed architect in Colorado since 1979 and holds licenses in Wyoming, Nebraska and New Mexico, along with NCARB Certification. 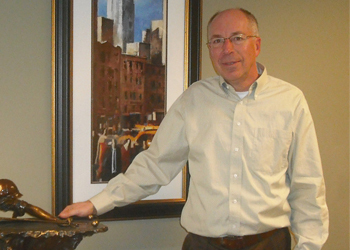 In addition to his professional practice, Alan is actively involved with several civic organizations in Loveland. He has served on the City of Loveland Parks and Recreation Commission, is a member of the Loveland Sertoma Club, past president of the Loveland Chamber of Commerce, Board of Directors for Center for Adult Learning, and Vice President of the Loveland High Plains Arts Council.